Jellyfish galaxies, exotic galaxies with “tentacles” made of stars and gas, appear as though they are swimming through space. 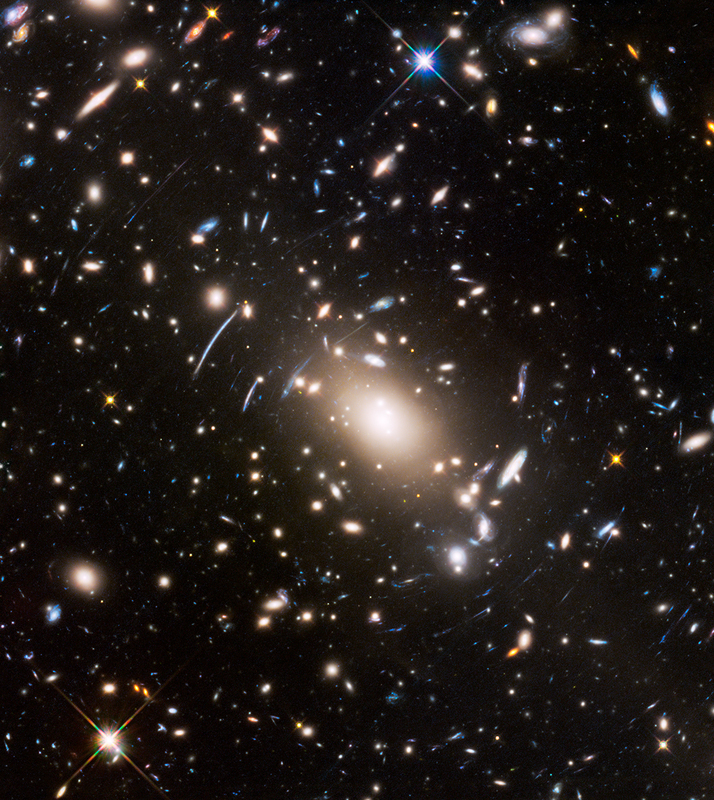 So far, astronomers studying the Frontier Fields have found several of these strange galaxies, and they are currently combing through the mountains of data to find even more. Sometimes also known as “parachute galaxies” or “comet galaxies,” jellyfish galaxies form when spiral galaxies collide with galaxy clusters. When the cold gas from an approaching spiral hits the hot gas from a galaxy cluster, the stars continue on, but the collision blasts the cold gas out of the galaxy in trailing tails, or “tentacles.” Bursts of stars form in these streamers, sparked by the shock of cold gas hitting hot gas. The tentacles, with their knots of newborn stars, trace the path of the colliding, compressed gas. Eventually, these jellyfish galaxies are thought to settle into elliptical galaxies. Some examples of jellyfish galaxies in the Frontier Fields. In each image, note the telltale, trailing “tentacles” of stars and gas. The left and right galaxies are from galaxy cluster Abell 2744. The middle galaxy resides in galaxy cluster Abell S1063. Jellyfish galaxies are sometimes also seen in less massive groups of galaxies. Their characteristic shape is, however, usually much more pronounced for spirals falling into massive galaxy clusters, because the gas they encounter there is denser, and because they move faster due to the stronger gravitational pull of the cluster. The higher speed results in a more energetic collision that, in turn, increases the pressure that strips the infalling galaxy of its cold gas and triggers widespread star formation. Astronomers have studied similar interactions in detail in nearby galaxy clusters but do not fully understand the much more violent process that creates jellyfish galaxies in very massive clusters. If the cold galactic gas is stripped very quickly these collisions could be the primary way by which spiral galaxies are transformed into ellipticals. Unfortunately, because the phenomenon is over so quickly, it is very difficult to observe. One expert on jellyfish galaxies—Dr. Harald Ebeling of the Institute for Astronomy at the University of Hawaii—explains that this is why astronomers are looking at extremely massive clusters, such as those in the Frontier Fields, in their search for a large sample of these galaxies. Aside from helping to explain why elliptical galaxies are so common in the universe, jellyfish galaxies capture the process of galaxy/gas collisions in action. Their trailing, star-forming tentacles may also explain the presence of “orphan” stars that do not belong to any galaxy. 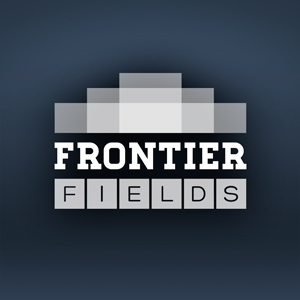 The work to uncover the secrets of the Frontier Fields goes on. Stay tuned for more exciting news on jellyfish galaxies and other oddities as scientists continue to study the vast amount of data collected in the Frontier Fields. One of the more philosophical concepts that astronomers have to deal with on an everyday basis is the commingling of space and time in astronomical images. The underlying idea is straightforward. The speed of light is finite. Light from a star or nebula or galaxy takes a measurable amount of time to cross the space between it and us. Hence, the light we see now left that object at some previous time. We view astronomical objects as they were in the past. As I like to say, looking out in space is also looking back in time. The implications of this maxim are considerable, especially in dealing with the deep field images from Hubble (see the accompanying image of the Abell 2744 Parallel deep field). 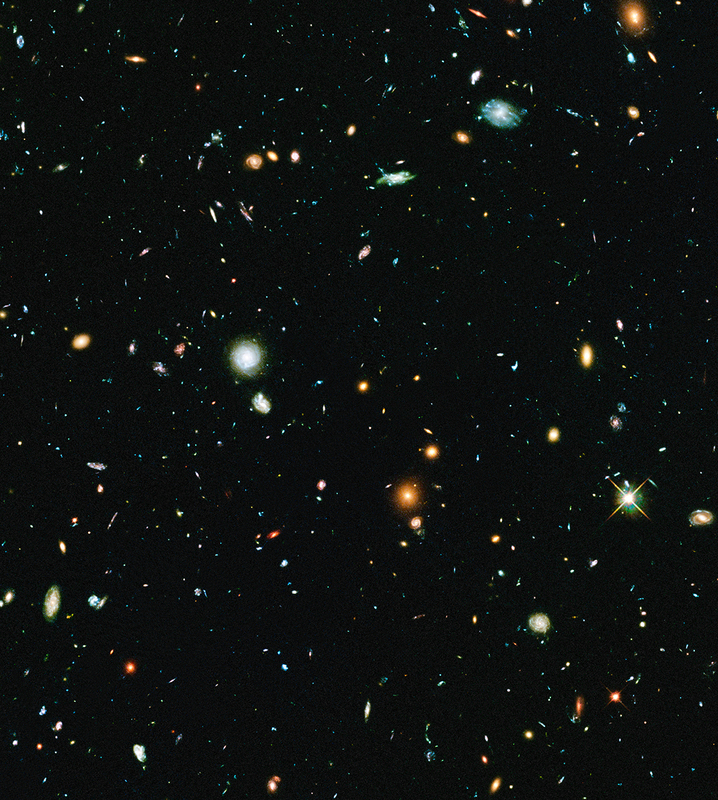 Such images contain a wonderful assortment of galaxies, with a few stars here and there. Each object is at a different position in space, both in the two-dimensional sense of a different position within the image and in the three-dimensional sense of being at a different distance from Earth. Further, objects at different distances are seen at different times in the past. Hence, astronomers must examine these deep field images in four-dimensional space-time. Tackling the expanse of space and time in these images can be mind-boggling. We’ll start with the stars, which are easier to understand. All the stars are local, within our Milky Way galaxy. These stars are generally hundreds to thousands of light-years away. The light we observe today might have left the star while the pyramids of Egypt were being built. Because stars don’t change appreciably on scales of thousands of years, stars in deep fields are just like stars in other astronomical images. The galaxies, however, stretch much farther into space. The nearest are many millions of light-years away, while the most distant are around ten billion light-years away. Galaxies don’t change much on million-year timescales. For example, it takes over 200 million years for our Sun to orbit once within our galaxy. Even though the light may have left a galaxy when dinosaurs first started to dominate our planet, the same galaxy would look similar today. Thus, the nearby galaxies in these images are comparable to local galaxies. Given billions of years, however, galaxies do change, and these deep field images provide compelling evidence. Distant galaxies do not have the standard spiral and elliptical shapes. They are often elongated, have bright spots of star formation, and are much smaller in size. We see galaxies as they were before the Sun, Earth, and the solar system formed. We study the development of galaxies over time to see how they form and grow. The perplexing point is that, for any given galaxy in the image, there is no distinct visual indicator of its distance in space or time. The layers of the universe are jumbled together across the image, and it is a grand puzzle of cosmology to sort them out. The usual method to determine distances, and therefore times, is to measure the cosmological redshift of each galaxy. That concept has been discussed in a Frontier Fields blog post by Dr. Brandon Lawton: “Light Detectives: Using Color to Estimate Distance”. Thus, I’d like to take this essay in a different direction. When discussing the cosmic mixture of space-time with an artist visiting from Spain, I happened upon a novel idea for a human-centric analogy. Imagine you are in New York City, specifically Times Square in Manhattan. You look down Broadway to the southern end of the island about 4 miles away. If the speed of light were extremely slow, traveling only one mile per century, what would you see? Each mile down Broadway would represent one hundred years of New York’s history. Each block would be 5 to 10 years earlier in the development of the metropolis. A quarter of a mile away, the southern end of the theater district would appear as it did in the early 1990s when “Miss Saigon” came to Broadway. Only a few blocks farther would be the disco era and the civil unrest of the 1960s, then the World War II years and the Great Depression. The Empire State Building, about a mile away, would vanish, as it was not built until 1931. At a similar distance, Madison Square Garden would be seen hosting heavyweight boxing matches in its original building, before the demolition and re-construction in the late 1920s. Progressing another mile down Broadway to Union Square would travel back past the Civil War, Tammany Hall politics, economic growth fostered by the Erie Canal, and Alexander Hamilton’s original run on the New York stage. The mile beyond to the SoHo district progresses through the times of New York as the capital of the United States, the Revolutionary War, the founding of Columbia University, and the importation of slaves by the Dutch West Indies Company. The final mile to Battery Park leads through the colonial era alternately dominated by Dutch or English foreign powers, past the garrison of Fort Amsterdam, to the island’s Native American roots and the initial explorations by Henry Hudson. A “slow speed of light” view from Times Square would lay out the entire history of the city of New York in a single view. The commingling of space and time would make it the historian’s exceptional equivalent of the astronomer’s standard observation: a deep view down Broadway. This idea of a time-warped view of New York provides an analogy to what Hubble uncovers: the history of galaxies compressed and jumbled within each deep field. Perhaps it can help you to look at these images from that requisite four-dimensional perspective. 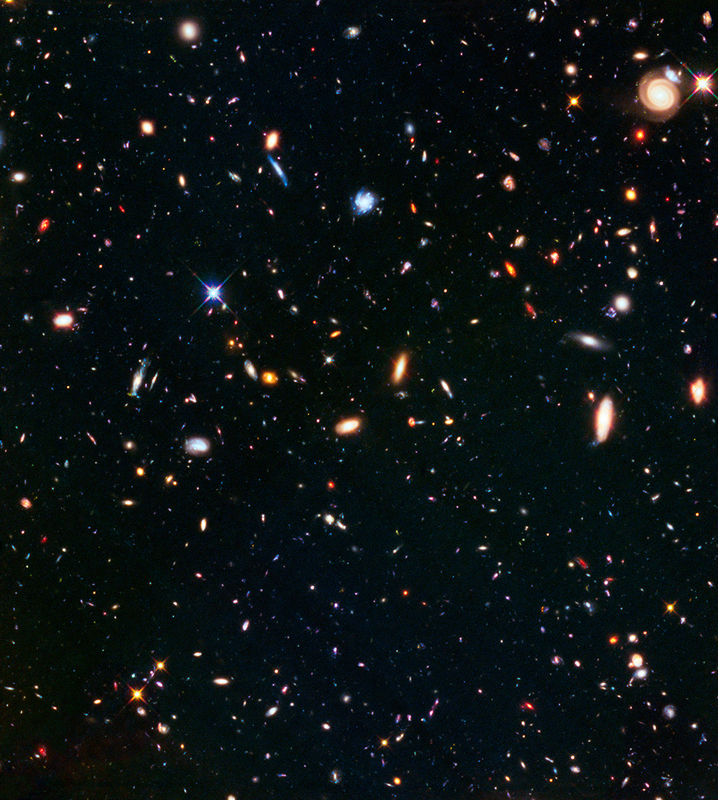 These deep field images are truly a trip down memory lane.